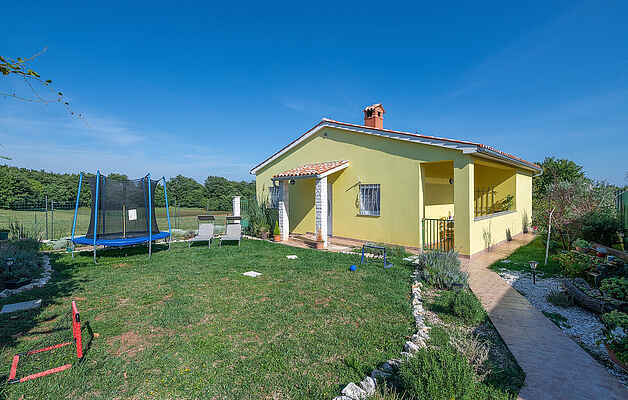 Spend a wonderful summer holiday in this holiday home with a well-kept garden. The residence is located in the village of Marčana and is the perfect choice for those who want to escape from the hectic of the everyday life in order to relax in a peaceful and natural environment. The pleasantly furnished interiors consist of a living room with open kitchen and dining area as well as two bedrooms with bathrooms en-suit. The covered terrace provides additional comfort and offers the possibility to grill comfortably with the glass of good wine. Discover the surrounding beaches such as in the village of Duga Uvala and enjoy the bathing in the crystal clear sea water. It is recommended to visit the old town of Pula and to explore the Roman amphitheater, the Arena.